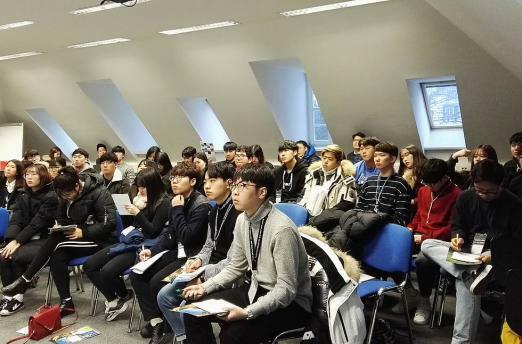 On January 22nd and 23rd, 40 students and professors from the Korean Dong-Eui University visited Dresden. Dong-Eui University is one of the leading private universities in Busan, the second biggest Korean city. The university is particularly known for its expertise in the fields of medicine and engineering. The visiting students, enrolled in automotive engineering, mechanical engineering and robotic technologies, took a stop in Dresden on their way through Germany keen to learn more on Industry 4.0 and Smart Factory. Industry 4.0 is not only on the rise in Germany, but also in countries like Korea, topics around digitization are gaining importance. Due to the close economic cooperation between Germany and South Korea, a bilateral exchange of knowledge on Industry 4.0 relevant topics takes place. On their first day in the capital of Saxony, the delegation learned about the region’s economy and the particular importance of Industry 4.0 for the business location Saxony. Nadja Dehne, Manager of International Affairs of Silicon Saxony, presented the history and activities of the high-tech network. Moreover, the students learned which Smart Factory solutions are developed and used within the network. Thereafter, the delegation visited the Industrial IoT (IIoT) Testbed of the University of Applied Sciences in Dresden. The IIoT Testbed is a research and evaluation infrastructure for IoT solutions in the manufacturing environment. During the two-hour visit of the delegation, technologies of the Smart Factory were presented which gave the students and their professors a comprehensive insight into the manufacturing world of tomorrow.